I had a craving for some curried parsnip pear soup and decided to make it for lunch. It tastes and looks like it is hard work, but it is a simple recipe that only takes patience, not hard work. To start I minced 1 TBSP of fresh garlic (3 small cloves) and 1 TBSP of fresh ginger (a piece about the length of a thumb) and added them to 2 TBSP of butter on medium heat in my soup kettle. While they cooked, I chopped up a yellow onion and put 1/2 cup of yellow onion in with the garlic and ginger. I added 1 TBSP of curry powder, stirred, added some salt and pepper and let sauté until tender. While that was sautéing, I peeled 3 parsnips and cut them into chunks about 1 inch square or so. The exact size matters less than trying to make them all uniform in size. I added them to the pot and added water to cover plus 1/2 inch. A bit of salt and pepper was added to taste. I cut up two Bosc pears. I did not bother peeling because this will be pureed and the pear skin is not tough and woody like parsnip peelings. I added the pears and put the lid on the kettle and turned the heat up to medium-high, bringing it to a slow boil. Then I let it continue to cook at a low boil until the parsnips were tender. Removing it from the heat, I removed the lid to help it cool faster and let it sit and rest until it cooled enough I could put it in my Magic Bullet. You can use a blender or an immersion blender. I pureed until smooth. I spooned some into a bowl, added a dollop of sour cream and 3 thin slices of pear. This happens to be Bartlett, but any ripe and tender pear would do. This could easily be made vegan by substituting olive oil for the butter at the beginning and leaving out the sour cream garnish. 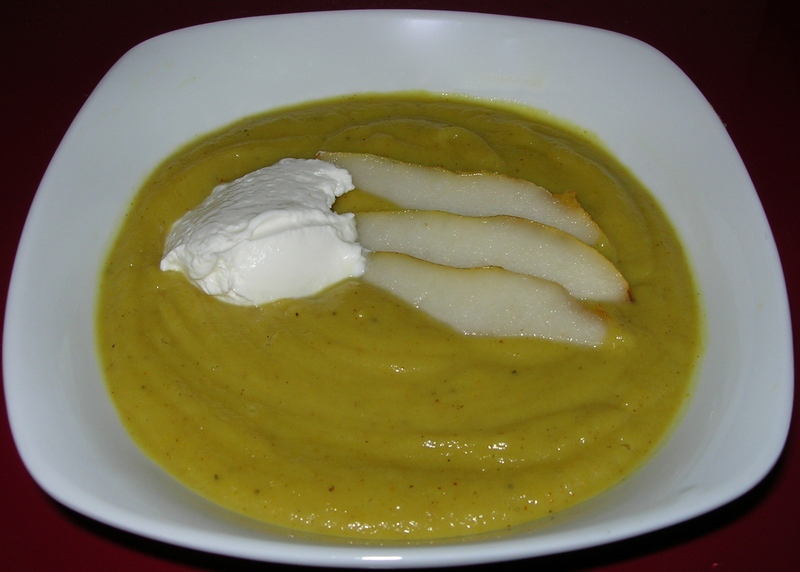 The soup itself is a delicious blend of the tart parsnip with the sweet pear. The bit of heat from the curry works well with those flavors. It is so delicious you might find yourself using a spatula to get ever last bite of soup out of the bowl. 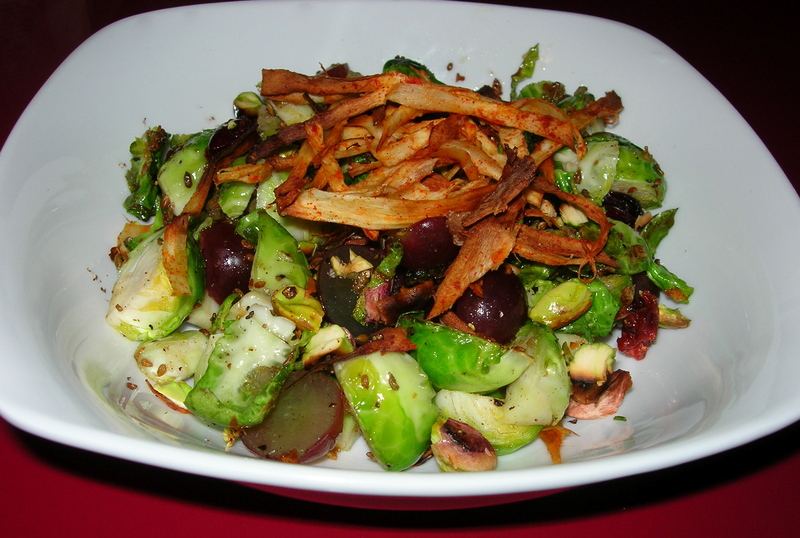 I made another salad using yesterday’s Caramelized Onion Vinaigrette. This was super simple. I peeled a carrot and a parsnip. Then using the peeler, I continued to strip thin strips off until I made strips of all of the carrot and parsnip. I then chopped the strips so they were less than an inch in length. I cleaned and chopped some red mustard greens. This is a rich dark salad green with deep red veins. It’s pepper and pungent and the sweetness of the carrot and the lemony tang of the parsnip balance it nicely. 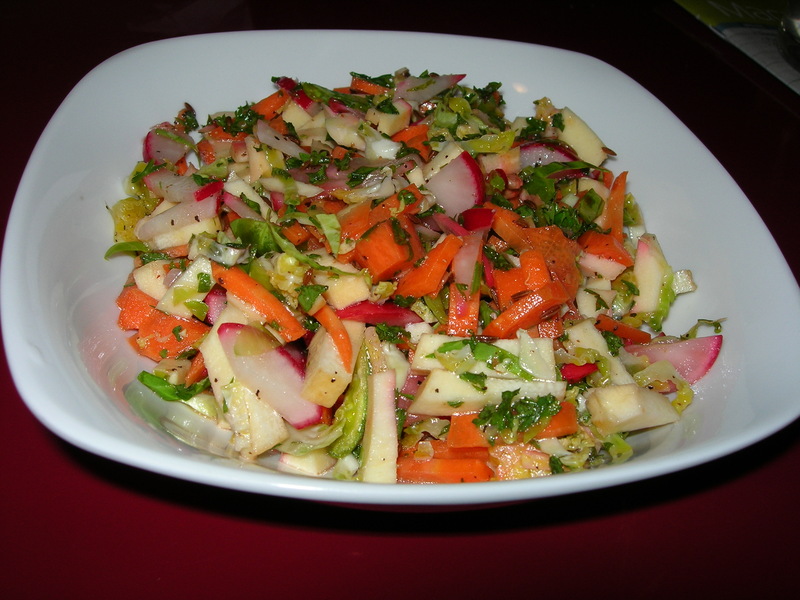 I tossed with the vinaigrette and had a delicious lunchtime salad. This was a delicious and successful experiment. I have been thinking rutabagas might make a tasty soup but was not sure how to approach them. I decided to give it a try today. I added 1/2 TBSP of olive oil to my soup pot and put it on medium heat. I then added about 3 TBSP of onions and the tiniest pinch of anise seed – about 10 seeds in all. I cooked until tender and then added two chicken andouille sausages. I know that is not authentic, but it is delicious. I browned the sausages slightly. While they were browning, I peeled and chopped into 1/2 bites 1 rutabaga, 1 parsnip, 1 carrot and 1 potato. I figured I needed the sweetness of the carrot and the mildness of the potato to balance out the tartness of the rutabaga and parsnip. I added enough water to cover everything and set simmer about 30 minutes or so until they were all tender. I removed the sausage and let the soup cool enough for me to blend it in my magic bullet. 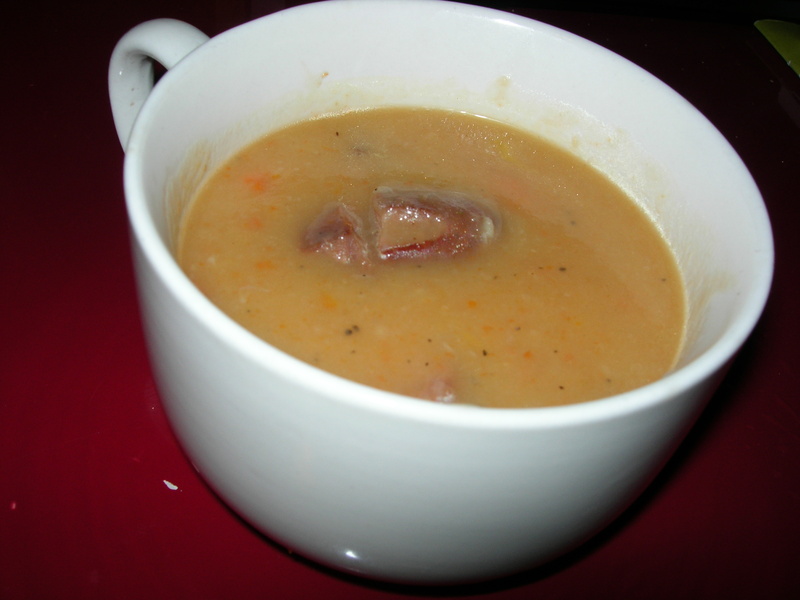 I pureed the soup, cut the sausages into 5 pieces each and put them back in the soup. This made two large bowls of soup that was a bit spicy, a bit tart and totally delicious. This salad is an explosion of flavor and texture. It takes a bit of preparation but if you can multi-task it takes about 25 minutes from start to finish and you end up with a salad that not only looks amazing, but is layered with so many flavors that it tastes like you spent hours on it. First you need to roast the parsnips because they will be the last thing to finish cooking. Preheat your oven to 420° F and using a vegetable peeler, shave off about 1/4 cup of parsnip shavings. Put them in an oven-safe dish or pan and sprinkle with some olive oil, salt and paprika. Use your fingers and mix it together so they are coated and put them in the oven to roast – about 20 minutes or so. You will finish the rest of the salad by the time they are done. They will be nice and brown but not blackened and will be slightly crispy. Put a sautee pan on the stove with 1 TBSP of olive oil on medium heat. Chop up about 1/4 cup of scallions and 2 cloves of garlic and toss in. Cook until the scallions begin to caramelize. While that’s cooking, clean and quarter 1 cup of brussels sprouts (about a dozen if they are small). Put about 12 pistachios in a dry fry pan and toast lightly while you cook the scallions and brussels sprouts. Shake the pan to keep them from burning and remove from the heat as soon as they begin to brown. When the scallions are caramelized, toss in 1 teaspoon of anise seed and 1/4 tsp of cardamom. Let it cook, toasting the seeds. The perfume will be pretty heady and give you an idea of how tasty this salad will be. Add the brussels sprouts and let cook until they begin to toast/brown. Meanwhile, cut about 10/12 grapes in half. The pistachios should be done, so you can remove them and cut them in half or thirds. By now the brussels sprouts are done. Remove from the heat and toss in the grapes and pistachios. Grate some fresh nutmeg on top. Put in a bowl and remove the parsnips crisps on sprinkle on top. What flavors are there in this salad? Sweet grapes, tart cranberries, smoky paprika parsnip crisps, bright scallions, the umami of pistachios, the fresh earthy sprouts and the rich, heady perfume flavors of anise, nutmeg and cardamom. Then there are the textures, the soft grapes, the dry raisons, the al dente sprouts, the crunch nuts, the crispy parsnip. It’s a small banquet all in one. Makes just one serving. But you might want to double because you may want seconds. 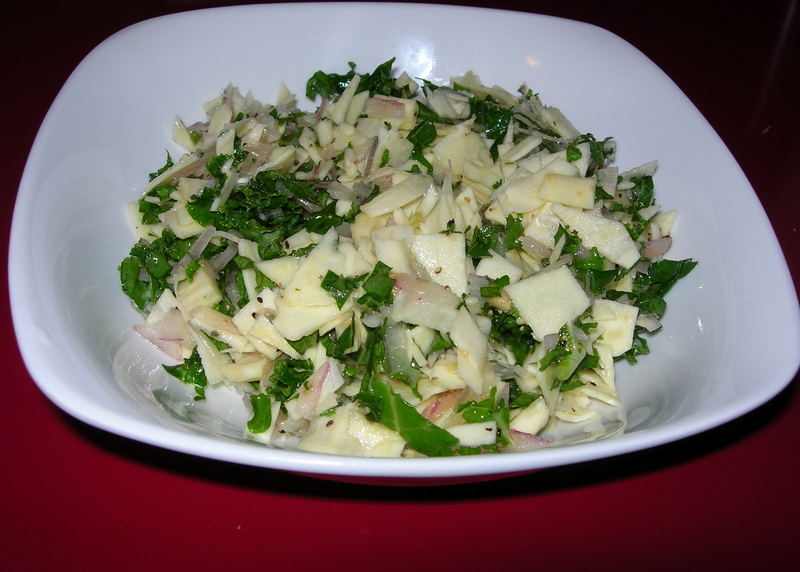 I was going to make another parsnip salad, but I didn’t have any parsley, so decided to try it with kale instead. It was delicious. So, I used a vegetable peeler to peel the parsnips and then continue to use the peeler to get nice shavings of parsnip. I cut them into smaller pieces. I added about 2 TBSP of red onions, chopped. 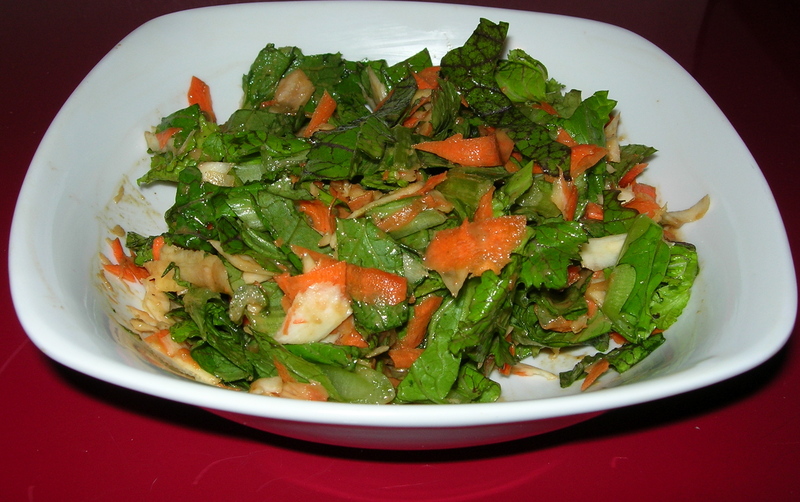 I took one leaf of kale and cut them in chiffonade strips. A little walnut oil and the juice of a half a lemon with some salt and pepper and voila! I let it rest about 20 minutes before eating to let the flavor penetrate the vegetables. It was so bright and fresh and tasty. This is a fast, easy salad with a bright tart flavor. I served it with leftover beef roast that i had coated with cracked black pepper and grated nutmeg and I doubt there could be a better match. It’s very easy to make. I peeled 1 parsnip and 2 small Jazz apples. I then sliced them on the mandoline and chopped them into little bits. I could have shredded them, but I had a bandage on my finger acquired while peeling that made shredding awkward. I then sliced about 1/4 cup of red onion and chopped that. 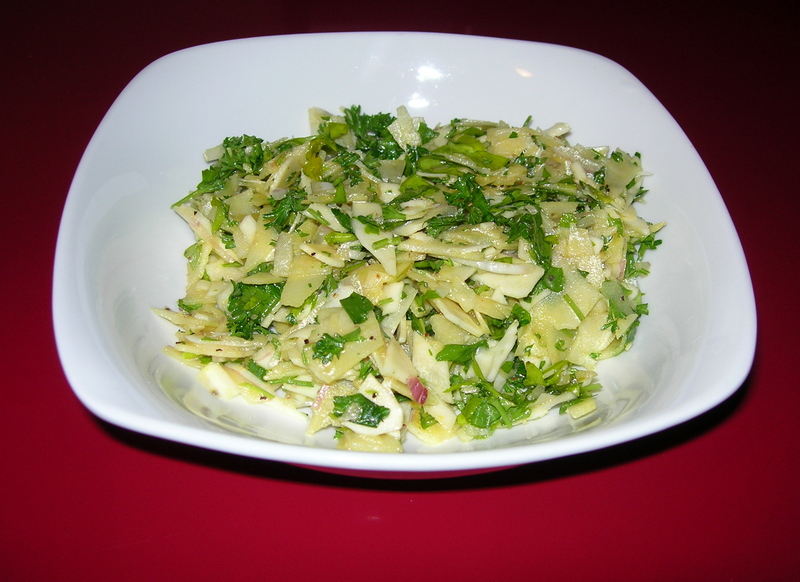 I added about 1 cup of chopped parsley. I cut a large lemon in half and squeeze the juice of half of it on the vegetables. Adding some salt and pepper and 1 tsp of mustard, I finished with about 1.5 TBSP of walnut oil (olive oil will do) and mixed it all together. I let it rest for 10 minutes or so for the flavors to meld and served it with my roast beef. The flavor is fresh and bright, tangy from the parsnips and the lemon with the sweetness of the apples and the earthiness of the parsley balancing them. The mustard added some nice heat to the mix. This made a second serving that I will have for lunch tomorrow and which, I imagine will taste even better since these are vegetables that hold up well in dressing. You will get several meals from this prep, but you can roast them one meal at a time and store the prepped veggies in a container in your fridge. The trick is to cut everything pretty close to the same size. For this batch I peeled and cut to 3/4 inch cubes the following vegetables. 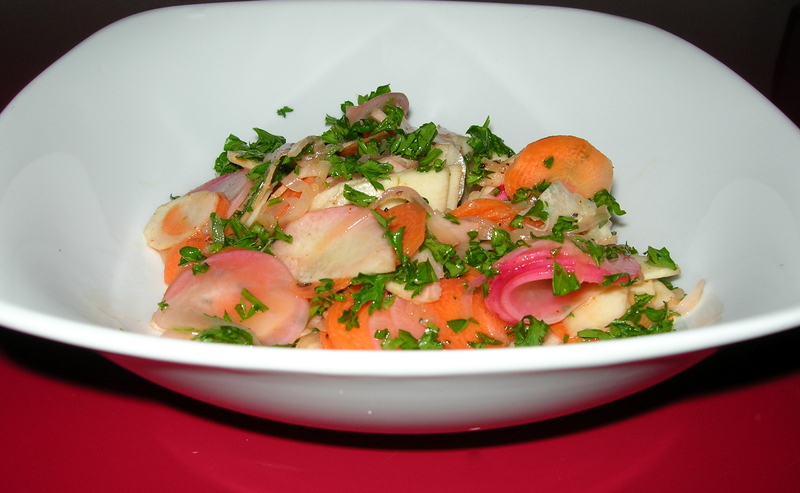 Not all are root vegetables, but they work well with the root vegetables. I would have included carrots, but served carrot soup with this meal and did not want to add more carrots to the meal. 2 small turnips. New seasons had a new varietal that was uncommonly small. 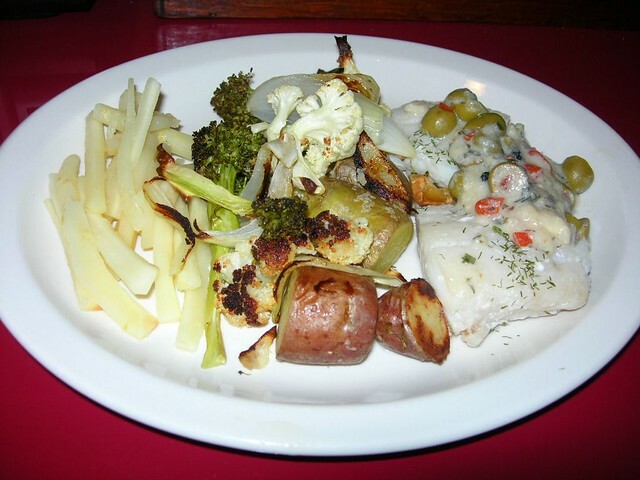 Generally the goal was to get about equal portions of each vegetable. I then took a whole garlic and peeled and separated all the clover and tossed them in as well. I sprinkle with about 2 TBSP of kosher salt more or less and 2-3 TBSP of olive oil and a spring of rosemary, removing all the leaves and chopping into 1/4 long pieces. With my hands, I mixed all the salt, oil and rosemary into the veggies to make sure they were completely covered. I put in a plastic storage bowl and let marinate overnight. I laid a few servings down as the bed for my roast and let cook at 300° while the roast cooked. After removing the roast, I increased the oven to 450° and let cook until the vegetables began to caramelize. This makes about 12 servings of vegetables, so I only roast one serving at a time. To roast them without the meat, just spread in a pan and roast at 450° for about 20 minutes. You can also boil and mash for a lush puree.